The marginal cost is the increase in total cost as a consequence of an increase in a production unit, or in mathematical terms, it is the first differential quotient of the total cost function. This can be expressed as a partial derivative of change of total costs and variation in one unit of production. The law of increasing returns implies that production is increasing more with impact of one additional unit of production, therefore the marginal cost gradient, as the second derivate of marginal cost is below 0 and firm is reducing marginal costs as result of production. The second scenario is law of constant returns, where the total cost curve is regular and smooth and change in productions maintain the same marginal cost and marginal cost gradient is equal to 0. The law of diminishing returns applies where total cost curve is convex and marginal cost increases monotonically, being marginal cost gradient positive when production increase. Firm´s decision to maximize profit depend greatly if marginal cost are lower than price of product, expanding production until marginal cost is equal to price. Average costs represent the quotient of the ordinate and abscissa of a point on the total cost curve. Also it is named as cost of velocity of production, where it measures the cost per unit, taking in consideration fixed cost and variable costs, divided on total production. Variable cost: where it is included only costs related to velocity of production. Fixed cost: related with investment required to produce the firm but it does not depend on velocity of production. The average cost start declining as result of average fixed cost falls with velocity of production. However, it will rise, as impact of fixed factors constrains production, limiting the benefits of increase production and impact in total cost per unit. To move from a lower average cost, firm requires increase the fixed factors of production to move to a new lower point, developing scale economics. As result of behavior of fixed and variable cost, average cost shape is U form. The usage of average cost is useful to know about total costs incurred by firm based on units of productions. Every velocity of production has a cost covering price and depending the amount of production with lowest cost covering prices is where enterprise can sell without generating losses. However, if firm is looking return investment, the respective price must be equal to average cost to recover fixed cost and variable costs. Maximization of profit can be obtained using marginal cost, where firm is selling with a price above its current cost and taking benefits, and its break-even is achieved when price is equal to marginal cost. For production decision purposes, the firm can choose to minimize its costs when average cost is the lowest as result of certain amount of production, implying the point where the company is more efficient producing with the lowest cost per unit. When velocity of production start to increase and there is increasing returns, Marginal cost is start to decrease, then change to constant returns in production and marginal cost and finally change to increasing marginal cost when production scale show decreasing returns. When velocity of production start to increase without presence of returns of scale, average cost start to diminish, then change to constant returns when velocity of production generates the minimum efficient scale and then change to increasing returns when average cost is greater than marginal cost. The marginal cost includes all costs incurred to produce one additional unit of product of firm and cannot be discriminated in fixed or variable costs. The average costs can be separated in average variable cost, where include costs related to velocity of production and average fixed cost where, only includes costs not related to level of production. 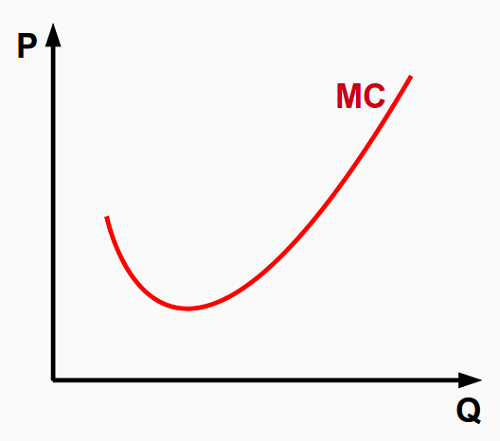 The marginal cost curve is concave with increasing returns, then change to linear and smooth shape in constant returns and finally change to convex when marginal cost show increasing returns. The average cost curve initiates fall as result of declining fixed costs but then rise due to increasing of average variable costs. Best criterion to decide production levels when objective is profit maximization. Best criterion to decide production levels when objective is minimize costs. 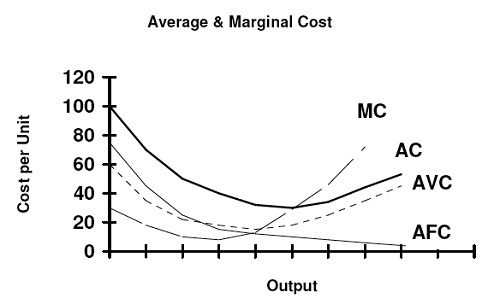 Marginal and average cost makes reference to organization´s theory of choice of velocity of production. Minimum efficient scale of production can be achieved where marginal and variable cost are equal. Marginal cost is the variation of total cost as result of variation in one unit of production. Average cost represents the cost per unit, including the fixed and variable cost required to produce the product. Average cost is composed in two parts, average variable cost and average fixed cost. The firm can choose to set price of product as equal to average variable cost and not incur in losses, or choose set price where it is equivalent to average cost to recover full investment of fixed cost. The firm has the choice of increase velocity of production as long as marginal cost is below to price of product sell and the limit converges when both costs are equal. The most important distinctive characteristics between marginal cost and average cost are referred to calculation and disjunctive between choose maximize profit or minimize costs. Luis Caro. "Difference between Marginal Cost and Average Cost." DifferenceBetween.net. January 31, 2019 < http://www.differencebetween.net/business/accounting-business/difference-between-marginal-cost-and-average-cost/ >.